A 9-patch image file is a specially formatted file so that Android knows which areas/portions of the image can or cannot be scaled. It breaks your image into a 3x3 grid. The corners remain unscaled, the sides are scaled in one direction and the center is scaled in both dimensions. A Nine Patch (9-Patch) image is a bitmap that has a single pixel wide border around the entire image. Ignoring the 4 pixels in the corners of the image. This border provides metadata for the bitmap itself. 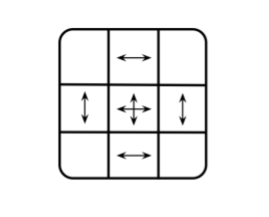 Bounds are marked by solid black line(s). A Nine Patch image is stored with the extension .9.png. The top border indicates areas that stretch horizontally. The left border indicates areas that stretch vertically. The bottom border indicates padding horizontally. The right border indicates padding vertically. The padding borders are usually used to determine where text is to be drawn. There is an excellent tool provided by Google that greatly simplifies the creation of these files.